In the 1980s, bumper stickers and T-shirts with the phrase "Eddie Would Go" spread around the Hawaiian Islands and to the rest of the world. According to maritime historian Mac Simpson, "Aikau was a legend on the North Shore, pulling people out of waves that no one else would dare to. That's where the saying came from – Eddie would go, when no one else would or could. Only Eddie dared." The phrase originated during the first Eddie contest. The waves were huge and the conditions were extremely dangerous. While the contest organizers were discussing whether to put it on, Mark Foo looked at the conditions and said "Eddie would go." The phrase stuck and then Eddie went. Another variation of the aforementioned popular phrase is "Eddie wouldn't tow." This phrase is in reference to the method of big wave surfing in which one surfer must accelerate another surfer (the former on a jet ski, the latter towed on a surfboard) to the speed of a large, fast wave. It is also partially in response to the controversy over the "unnaturalness" of tow-in surfing; many surfers feel that being towed in to a wave, as opposed to paddling, is against the spirit of the sport. Other variations of the phrase include "Eddie would throw" (in support of the University of Hawaii's passing attack by Colt Brennan and Timmy Chang under head coach June Jones), "Eddie wouldn't crow" (in opposition to boastful and egotistical surfers), and "Eddie would hoe" (in support of Native Hawaiian agricultural outreach programs). Another variation used recently during the 2008 election campaign for Honolulu rail transit was the slogan, "Eddie would ride." Austin, TX band Full Service recorded a song about Eddie Aikau called "In A Rescue," found on their 2006 album "Recess." They performed the song at the Full Service Circus in May 2013. Sam George, an ex-professional surfer, directed a 30 for 30 documentary about Aikau called Hawaiian: The Legend of Eddie Aikau. It premiered on ESPN on October 1, 2013 and details Aikau's life from childhood to his death. Eddie's story was humorously (and respectfully) told by comedian Kurt Braunohler in a second-season episode of Drunk History that was dedicated to Hawaiian history, which aired on August 12, 2014. Eddie's story was told by Karen Kilgariff on Episode 160 of the podcast My Favorite Murder, which aired February 14, 2019. ^ a b Stuart Holmes Coleman. Eddie Would Go: The Story of Eddie Aikau, Hawaiian Hero and Pioneer of Big Wave Surfing. New York: St. Martin's Griffin, 2004. ISBN 0-312-32718-8. ^ Coleman, Stuart Holmes (2004). Eddie Would Go: The Story of Eddie Aikau, Hawaiian Hero and Pioneer of Big Wave Surfing. New York: St. Martin's Press. p. 164. ISBN 978-0-312-32718-7. ^ Cisco, Dan (1999). Eddie would go. University of Hawaii Press. p. 278. ISBN 0-8248-2121-1. ^ Hawaiian senate – Eddie Aikau Honored in Senate. ^ a b Burlingame, Burl (1998-03-06). "Eddie: Riding on the crest of a myth". Honolulu Star-Bulletin. Retrieved 2006-04-09. ^ Craig Hysell. "It Could Be Worse: Eddie Aikua". Celebrate Hilton Head website. ^ a b "The 2009/2010 Quiksilver in Memory of Eddie Aikau – History". Archived from the original on 2009-12-07. Retrieved 2009-12-10. ^ "Clyde Aikau and the State of the Eddie – A Feature Interview". 2009-02-11. Archived from the original on 2009-12-13. Retrieved 2009-12-10. ^ Coleman, Stuart H. (2005-07-01). "Waterman: Brian Keaulana and the Rise of Ocean Safety". Spirit of Aloha (Aloha Airlines). Archived from the original on 2006-11-29. Retrieved 2007-02-07. Coleman, Stuart. Eddie Would Go: The Story of Eddie Aikau, Hawaiian Hero and Pioneer of Big Wave Surfing, MindRaising Press, 2003. 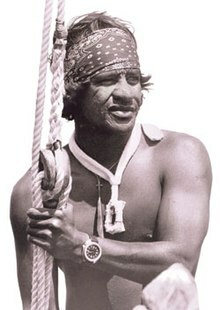 Biography of Eddie Aikau. Coleman, Stuart. Eddie Aikau: Hawaiian Hero, Bess Press, 2016.